This Infinity Command Center 6040CR is a favorite computer workstation for applications requiring the use of up to 4 monitors. 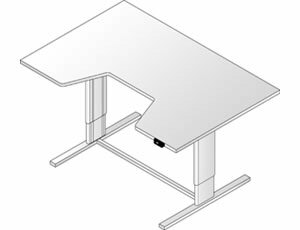 The expansive worksurface measures 60 x 40 inches with a comfort recess that creates a surround-view for applications such as Radiology reading workstations or PACS tables. Each user can work in a seated or standing position to vary their posture throughout the day. Height adjustment between 27-39 inches is available with the push of a button. A sturdy steel frame provides unsurpassed stability even in the highest ranges and has a weight capacity for up to 500 lbs. of equipment.